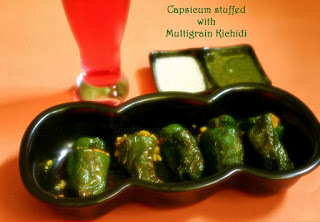 Capsicum stuffed with multigrain kichidi . A simple dish baked in oven with very less oil. I have used bell peppers of small size as I had only a small cup of kichidi left out after our morning breakfast and it was sufficient to fill up. 2. Wash & Cut the top portion of the capisicum and remove the seeds. I generally don't throw the seeds, instead use them in sambar or curries as it gives a good flavor. 3. Stuff the kichidi into the bell pepper. 4. Seal the stuffed bellpepper with the cap. Since the kichidi is a bit sticky by itself, the cap will get sealed nicely by itself. 5. Take an oven baking tray and brush it with oil. Place the bell peppers and brush them with oil and sprinkle the pepper on top of them. 6. Preheat the oven at 180 degrees and keep the tray. Make sure to turn the capsicum inbetween to cook on both the sides. In microwave you may use the grill option, however I have not personally tried that option. Alternatively, you may also put this in the non-stick tawa and add a little oil and toss it. Stuffed capsicum is ready. You may serve it along with mint-coriander chutney and some simple raita. You may choose to choose some lemon juice to the kichidi before filling.